Charlie Grantham clears up the differences and similarities between the concepts of wellness, well-being, and wholeness. Is wholeness in the workplace fake news? The purpose of this article is to answer that fundamental question. Further, I hope to clear up some of the confusion that now exists in the current technical literature concerning the differences and similarities between the concepts of wellness, well-being, and wholeness. Many articles on wellness in the workplace have continuously been in the news. A simple Google search yields over 4.5M hits. For example, state of the practice reviews has been published in this magazine and elsewhere during the past year or so. Mind you, I don’t necessarily disagree with these authors, but I believe they are still operating within a dated thought structure. This isn’t enough anymore – it’s time to move on. You get the whole person to work; they have a nice desk, a window, employers structure performance reviews so their egos are bruised and yes there is a meditation room on the roof. Now what? That’s what we’re talking about here. I want to advance the somewhat radical notion that a lot of what workplace designers hear about ‘wellness’ is a variant of the ‘fake news’ concept. Literature, websites, and overstuffed social media filled with what on closer examination are alternative facts and uninformed opinions. Image courtesy of Rex Miller and Michael Lacocki. So where do you go to get the real news about wellness and wellness programs? Currently, the best source is a new book by Rex Miller, The Healthy Workplace Nudge: How Healthy People, Culture, and Buildings Lead to High Performance. The title says it all. However, take a look at this cartoon is from a comic book which accompanies Rex’s book. Note the conclusion in the bottom, right-hand corner. OK, let’s get to the real story. Let me distinguish between these three concepts of wellness, well-being, and wholeness. In doing this, I’m going to draw on the rich social psychological literature which relates these concepts to three dimensions of human behavior – especially in the workplace. Wellness refers to those things that we see as physical and usually measured as physiological variables. I prefer to relabel this function is the “hand” part of our daily experience. These three concepts are not separate. They have overlapping parts as we would see in a Venn diagram, or even more crudely in a linear relationship where one comes before the other. As you can see in the picture below, I view these concepts as being nested, and systematically related to one another with feedback loops, signal attenuations, and amplifiers. Let me explain with a quick example. When our state of well-being is out of balance and was having trouble balancing the stresses of our life with our coping mechanisms this component sends signals to the wellness aspect of our lives, which is physiological. Heart effects hand. What happens when we get upset at work, disagree with a colleague, or engage in a conflict with the supervisor? We get stressed. We then sense that our blood pressure raises, our heart rate increases, and in some cases, we may even experience anxiety attacks. The point here is that one aspect of our whole self-interacts with other elements. To me, this implies that we must deal with all three of these ideas and concepts simultaneously. We cannot deal with them individually. Managing these ideas in the workplace means that workplaces need to be designed to take into consideration physiological effects (i.e., such as temperature, air quality, and noise). We also need to be looking at the social or emotional side of things such as our social networks coping mechanisms the resources provided to us such as sanctuary rooms, quiet areas, and a connection to the outside larger environment. However, it also means that the workplace needs to take into consideration the idea of a person’s purpose and how that manifests itself in the work environment. Employers need to provide their employees with adequate, effective, and affordable healthcare. When they do this, it helps keep employees engaged, productive and happy. But, how do you do this? In preparation for this article, I recently attended an international conference on the future of healthcare: 3,500 experts from around the world, over 200 product and service vendors, and an intense level of interest among everyone. There were two primary concepts that I took away from the conference. First, the work environment is an ecosystem which extends beyond the mere physical space where we conduct work activities. We need to take a systems perspective, and we can’t have silos that isolate the facilities management function from the technology function nor the human resources function as we currently know it. Especially not if you want to approach workplace design as a strategic element of the overall workplace strategy. The second major point that brought home was the need to exploit technology in the service of healthcare and the whole person. Let me shift a bit and talk about what strategic foresight specialists call “weak signals.” These are the things that are slightly over the horizon, under the rug or just around the corner. They’re coming at us in ways that are not entirely clear yet, and the information we’re getting is not quite strong enough to lead to discrete action. Now is the time to become alert, cognizant, and on the lookout for these weak signals before we hit the iceberg. A US-based company which is right out on the cutting edge of this conversational agent platform. They are a late stage software focused, privately held, startup based on Portland, OR. To get an idea of just how significant this new technology trend can be, I spoke with Chris Edwards, chief marketing and experience officer at Conversa Health. What are the workplace design implications of this kind of technology impact? I think you could ask how much workspace is currently devoted to the customer care function in healthcare? What happens if you reduce that need for space by 85 percent? That’s not fake news, that’s reality. e3 Enterprises, a startup company out of Tokyo, Japan, is just now entering the US market, so they are flying under the radar. They are uniquely dedicated to developing devices that look at three problems: contaminated atmosphere and water / difficult lifestyle habits / thin family bonds. The thing that I found quite fascinating, in this is not merely an extension of the chat about technology but they are providing physical and software product aimed at increasing the engagement of people with their healthcare providers and extending the ecosystem from just the workplace employees homes and their communities. Right now, they have a test in the field where they are providing some of their products to a large industrial client in Japan, which gives these products to their employees for use in the home. Examples include air quality monitors or at home glucose testing. The core idea here the change in the wellness provisioning model. 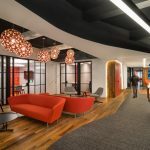 The expansion of providing healthcare going from just the physical workplace back through the employee into their residences – again wirelessly connecting everything. The workplace has now become the home as well. Lastly, I want to highlight another company that is extending the conversational platform to the provision of advice, coaching, and structured learning for employees to “move to action to improve the quality of their wellness, well-being.” myStrength bills itself as a digital behavioral health company based in Denver, CO.
myStrength uses a digital platform to add an interactive style of a conversation between patient and system to helping “even those with no diagnosable condition enhance their everyday sense of wellness and well-being.” What I found to be unique with this platform is the emphasis that they are placing on delivering, and an interactive session, tailor-made well-being an inspirational resources to people. The primary benefits that this variation in the conversational approach is that it provides increased engagement and increased access. It can answer the question: who on the design team is responsible for social ambiance? Wholeness is more significant than anything people are talking about right now it’s the physical, emotional and yes, spiritual wrapped up together. Each of these factors impacts the others, and there are feedback loops from one to another. The simplest example (that we have all experienced) is seeing how an emotional state such as increased anxiety manifests in the physical through an increase in blood pressure. Conversely, techniques like mindfulness can decrease stress, and you see a consequent decrease in blood pressure. Another example could be a loss in the sense of purposefulness shows up in all kinds of ways. People are made up of more than their blood pressure and anxiety levels – that’s the ‘fake news.’ People want purpose directed and intend to do more than exist. Usually, people satisfy this drive be belonging to a faith-based organization, religious practice and self-help groups. They need a way to track, monitor and manage that parts of their lives. Technology is rapidly moving to fill this gap in self-care knowledge. We first saw it with ‘fitness trackers’ that monitor the real past of living. Now we see software applications like Woebot which is on-line ready to listen to your emotional concerns and offer advice in real time to help keep you balanced. Moreover, of course, there are dozens of applications for meditation practice such as Simply Being and Calm to provide self-care at a more spiritual level. So, just as you would not be advised to safely fly an airplane without an altimeter, don’t navigate through work and life without using some of these tools. The good news is the social sciences can tell us a whole lot about how this works, but we need to move beyond a simplistic medical mindset to get there. For some, I may suggest that the reconnaissance of the practice of healthcare and some of the non-traditional Eastern societies might offer us some guidelines and a pathway towards this goal. If we truly want to deal with people in the sense of their complementary wholeness in the workplace, we are going to have to get beyond merely having rote training programs. Training programs are excellent and certificates do demonstrate a level of technical skill but unless they are based on a multi-dimensional model of wholeness, they can give managers and designers a false sense of total workplace design competence. The real news is that this interdisciplinary workplace design approach is attainable. Most of the tools you need are already here, and some others coming along fast as you can see. What is required is a change in design perspective from maximizing individual factors (i.e., physical, psychological, and purpose directed) into an integrated systemic perspective. All the buzz from last week's WORKTECH 15 conference in San Francisco.